IN 1754 Anthony Henday (yes, that Henday) became the first European to enter the area now known as Edmonton. In 1904 the town formerly christened Fort Edmonton was incorporated as an official city. In 1984 the Oilers won their first of five Stanley Cup championships. And, in 1993, Edmontonopoly was born! Okay, so maybe that last one wasn't as memorable or significant an occasion as the others in our "city of champions," but it at least deserves an honourable mention, no? Designed by Bernard Nurit and published by Custom Games & Packaging Ltd. (of Langley, B.C. 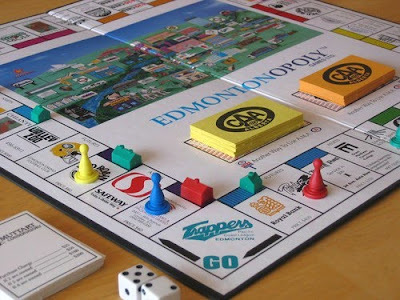 ), Edmontonopoly was one of many spinoff versions of the world's most popular board game Monopoly (est. 1935), which--I kid you not--will be the plot behind a Ridley Scott movie in the works! There have been literally hundreds of different spinoff renditions based on particular locales or themes, from TV shows (The Simpsons) and sports teams (New York Mets) to superheroes (Batman) and even cola (Coke). There were also dozens and dozens of versions set around specific cities, regions or countries, including our own little corner of the world. Edmontonopoly substituted the likes of Boardwalk and B&O Railroad properties (based out of Atlantic City, New Jersey) for our own local businesses, such as Grant MacEwan, the Space & Science Centre, Westmount mall, 630 CHED, Chianti Cafè, Fort Edmonton Park, the Muttart Conservatory, and ITV News (now Global). This specialty edition, which sprouted at the same time as versions based on Calgary, Vancouver and even Banff, first hit store shelves in 1993 and sold for about $27. These days you'd be hard-pressed to find a copy of the rare board game, unless you scour thrift stores or garage sales. Don't bother trying eBay though...I beat you to it. Got a copy? Call me! I have one .what would you give for it??? I have 2 of these. Both still mint, like they were just opened.